Westend Laser Clinic, an approved ELOS hair removal Clinic right here in Ottawa. If you find that waxing, shaving and plucking can irritate your skin then an ELOS laser hair removal treatment could be perfect for you. Producing long lasting results, our trained technicians will take care of you and ensure terrific hair removal results every time. 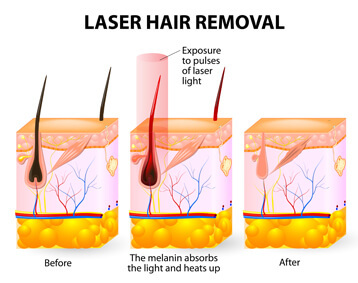 WHY CHOOSE ELOS LASER HAIR REMOVAL? Whatever your skin type or hair colour our new laser hair removal system will prove to be fast, safe and of course an effective way of handling your hair removal, giving superb results every time. Traditionally lasers haven’t been effective for people with either darker skin tones or lighter hair colour. However this new ELOS Laser has revolutionized the industry. After decades in the business, Westend Laser Clinic chose ELOS Laser Hair removal as our #1 choice. This revolutionary ELOS System stands for (Electro–Optical–Synergy). It combines Bi–Polar RF (Radio Frequency) with the high powered Diode LASER. We’d even say it is one of the safest, fastest and most effective hair removal laser treatment available. Cooling of the skin surface as well as constant measurement of the skin’s resistance ensures safety and comfort during treatment. This is a no downtime procedure. However, if a client feels any discomfort we do carry Zensa Numbing Cream which is an FDA and Health Canada approved product with 5% Lidocaine that desensitizes skin for procedures prior to laser hair removal. Also containing health conscious ingredients like purified water and Vitamin E, which provide anti-inflammatory properties, it has a neutral pH and is the most natural numbing cream on the market. Backed by a three-year shelf life, it is also the most stable topical anaesthetic available.